During the past week, I've seen bearding around the front of the hive. This mostly happens in the evening after a couple of extra hot days of 100+degree weather. But now it's happening more during no-so hot days. I opened up the hive and it is full! Full of brood, honey & bees. Hive is two 10-frame mediums with 2 follower boards (so, 16 frames total). Pulling the outer side frames of the upper box showed heavy - mostly nectar and 20% capped honey. 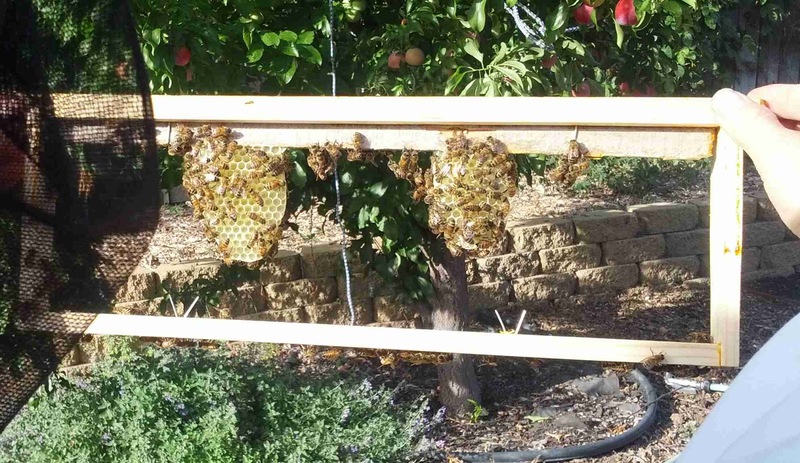 This is new (since I started giving fruit from near-by plum tree) I don't want them to run out of comb-space, so I decided to add another box. But with queen excluder under. The new box has spacers for 9 frames installed. These are added in pairs to the box before frames are installed - makes fatter honeycomb. I pulled a natural comb frame out from the (old) top box and put it in the middle of the new top box, I also put empty frames on either side of it. The rest of the slots have new frames with foundation. 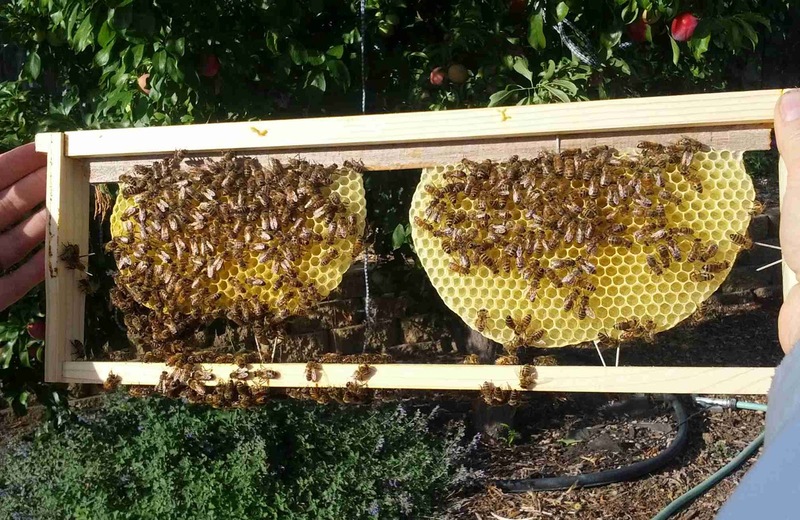 The goal is to not take very much honey - just a small clean sample then give back the rest and then pull the queen excluder. I want to be nicer to them this first year because of our 4 year drought here in northern california. No ants at all around hive for quite a few weeks now. Only a couple of 'pincher bugs' and one silverfish. We have something still blooming around here. 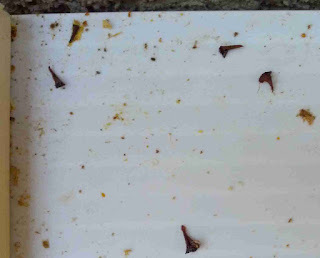 There is lots of pollen coming into hive - is mostly white, some orange. So, in our area things are starting to slow down as far as blooming. Although, there are some other plants/trees that are starting to bloom. That will be short lived and the bees will be looking for other sources of nectar. My plum tree is exploding with fruit and I'm having to go out and chase off the birds quite often. Hanging DVD/CD's and building a scarecrow is only slowing them down. 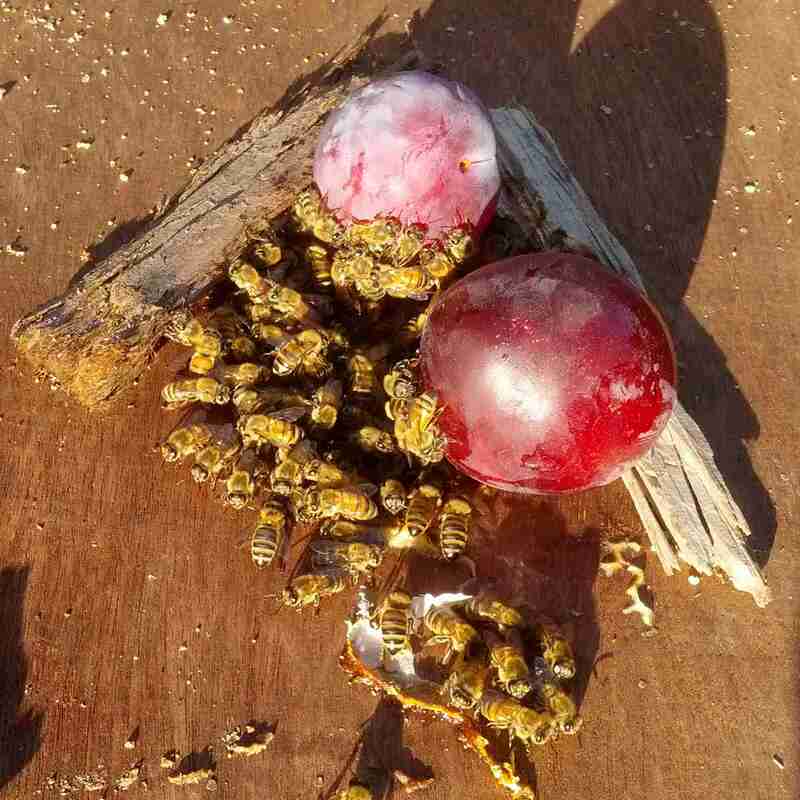 While picking ripe plums, I noticed one of the bees at a piece of fruit that was pecked open, yet still on the tree. This had me thinking - I'll give ripe plums to the hive to see if they would eat them. You'll notice that most of them are actually not consuming it - but they're all coming up to encompass it, as if they were all hugging it and saying "thank-you thank-you". Although, this is more of a protection and defense against the ants that could eventually come in - which is normally just an annoyance, but competition in this case. Up to this point I have only used wood frames with foundation of embossed black plastic that is wax coated. This works for a lot of beekeepers. However, some bees hate this kind, but I have been lucky so far. I eventually want to transition to wax foundation or just all natural comb - good for comb honey. So, I decided to install two empty foundationless frames, one in each box - upper & lower. Well, here we go. I was wondering if this day would come. Anyway, now that it is sticky with Crisco - I have discovered "Varroa destructor" It's a parasitic mite that only reproduces in honey bee colonies. It attacks honey bees and spreads varroosis disease and also transmits DWV, the deformed wing virus (I actually remember seeing one bee running around last week with a messed up wing.) Now that I'm actually able to find mites, and count them, I count ~ 20. Included is a video I took of one I saw still alive and kicking. I have found various dead bees around during the last week. However, that is expected - we are now in the middle of a 4 year drought. The weather bounced from rain to 104 degrees to full thunder/rain back to 100 degrees again. 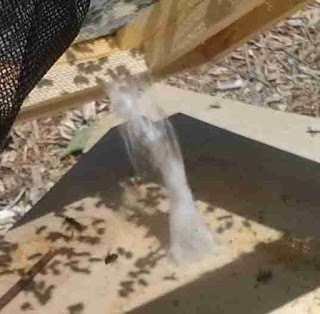 After all this, I'm not worried about anything, this hive seems to be strong and going well. 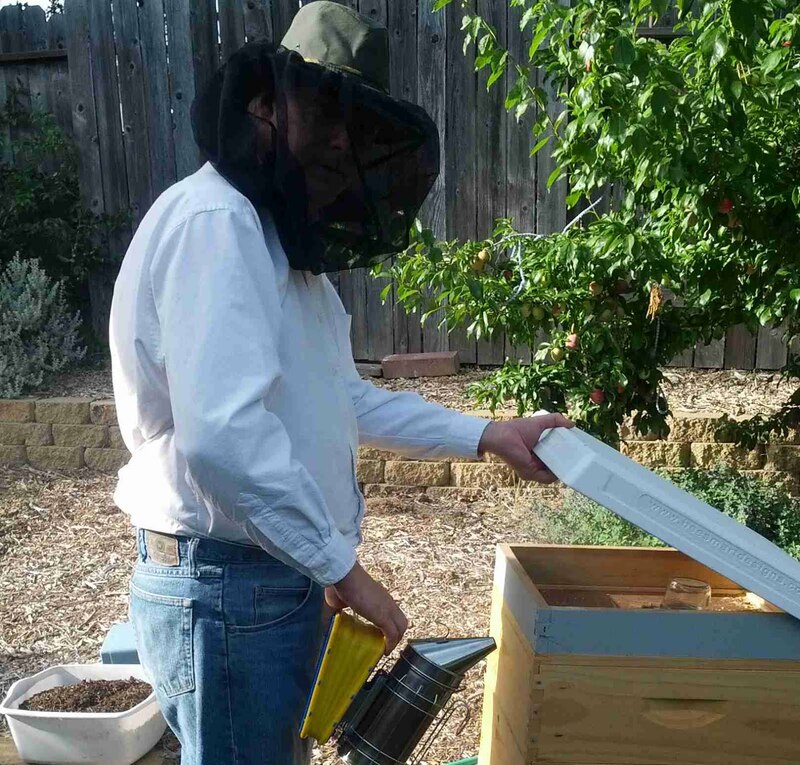 The queen is cranking out enough eggs for new bees to overcome any environmental setbacks. However, I will open it up this weekend and do another inspection and document anything (else) of interest. Okay, this is strange. Over the last week or so, I've been noticing these strange droppings. (click photo to enlarge) They look like rose thorns but black in color. They're stuck to the removable bottom board but they can easily be picked off. This is still puzzling and I'm still looking for some clues - what is this? He thinks it might be a result of a spider (no exact explanation though)... I did pull the whole hive off the stand and found a sizable white patch looking like from a spider. I freaked-out at first thinking wax moths, but the location seems wrong for wax moth. So, I still don't know. Small Hive Beetle: A recently imported pest whose larvae will destroy comb and ferment honey. This is the 3rd time I saw a small hive beetle 'SHB' in my hive - once on a frame and twice on the removable tray / screened bottom board. Because I haven't made my removable bottom tray sticky, I'm not actually sure if this is the same one I keep seeing over and over. From watching a video from University of Florida Honey Bee research and extension laboratory these can be completely devastating. Something to keep an eye out for. I will be making my tray sticky to catch them - I'm hoping it's an isolated incident.